Interview with a Zinester: Caroline Tompkins! 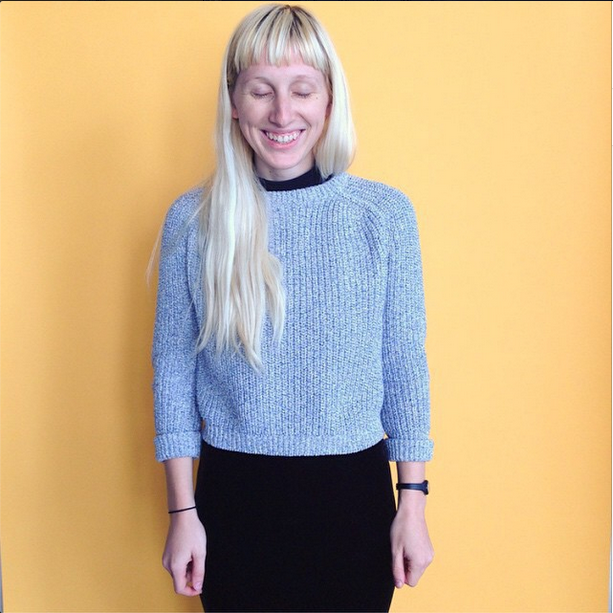 This lovely interview is with the zinester behind Girl Pains, Caroline Tompkins! Take a gander. Blond long-haired Caroline with eyes closed stands in front of yellow wall. Born in Cincinnati, OH during the early nineties, I recently received a BFA with Honors in Photography from the School of Visual Arts in New York. My mediums of choice are photographs, Shrinky Dinks, zines, soft sculpture, hard sculpture, dancing and kissing. My work has been featured on the Huffington Post, Al Jazeera America, BBC, and Dazed among others. I currently live in Brooklyn working as an Assistant Photo Editor at Bloomberg Businessweek and Studio Technician at the School of Visual Arts. I try to care as much as I can. been super exciting to me. I’ve always been attracted to the “anyone can do it” approach to making zines. Well, I’m a feminist, so I think that’s going to show through in whatever I am making. Making a zine about X-Files may not scream a certain feminist agenda, but when you think about a character like Dana Scully and her relationship to feminism, the connection becomes clear. I like to think my work normalizes feminism in a way that separating it as such is not necessary. It’s so difficult to pick a favorite zine. I really like the work of Caroline Paquita, Andrea Kalfas, Jensine Eckwall, Daniel Zender, Kaye Blegvad, Lizzy Stewart, Got a Girl Crush, Raleigh Briggs, Women Artists, Liz Prince, Ramsey Beyer, and so so so many others I’m sure I’m forgetting. I really like zines that are aesthetically considered and have precious elements. Let’s be real, I’m an ice cream maker through and through. Gosh so many! I’m stoked on Hazel Newlevant. Her and I went to school together! Always siked to see her doing cool things. Previous Previous post: Interview with a Zinester: From the Root Zine!